There’s something about spring that makes us crave fresh, raw food. This salad is ready to answer the call. It’s vegan, loaded with healthy ingredients, and it’s chock-full of satisfying crunch. Add it to your favourite BBQ veggies or serve it as the main meal. Or, pile it onto your vegan (or not) burger. Start with the dressing so the flavours have a chance to marry while you prepare the salad. Combine all salad dressing ingredients in a mason jar, cap it and shake. If you want the dressing to be a little creamier, you can blend it with a bit of water to activate the emulsifying characteristics of the tahini. The tahini really is the secret to this recipe. In a large bowl, combine the salad ingredients. Be sure to cool the seeds and nuts before adding them. Cut the Ambrosia apples last and gently toss them in so you don’t bruise them. Drizzle with dressing and toss. Get creative! Don’t be afraid to add other ingredients you love. We’ve experimented with adding dried tart cherries (from the Okanagan, of course), a mix of different cabbages and kales, and raw hemp hearts. They were all good, but the original salad is divine in its simplicity. We can’t get enough of this salad. We take it to potlucks and picnics and it’s always popular. 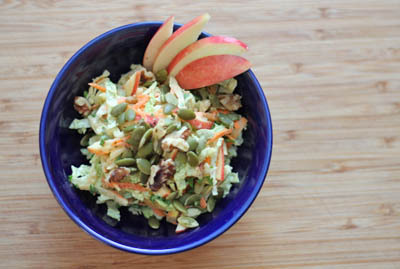 Plus, Ambrosia apples are slow to brown, so this slaw looks fresh for a while – we don’t know how long exactly because it never lasts that long!